Western people love sentimental poetry. 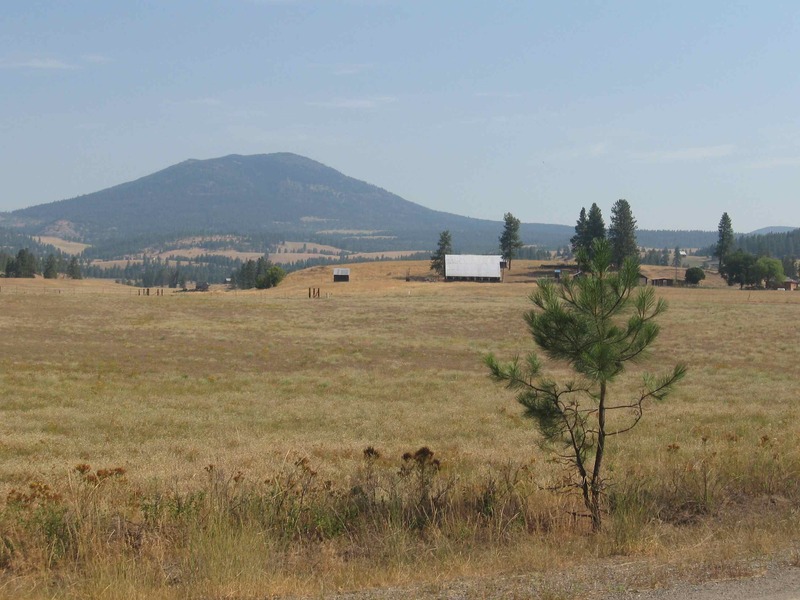 The RV Park we stayed at near Kettle Falls was on its last legs and for sale. All right, it was a dump. 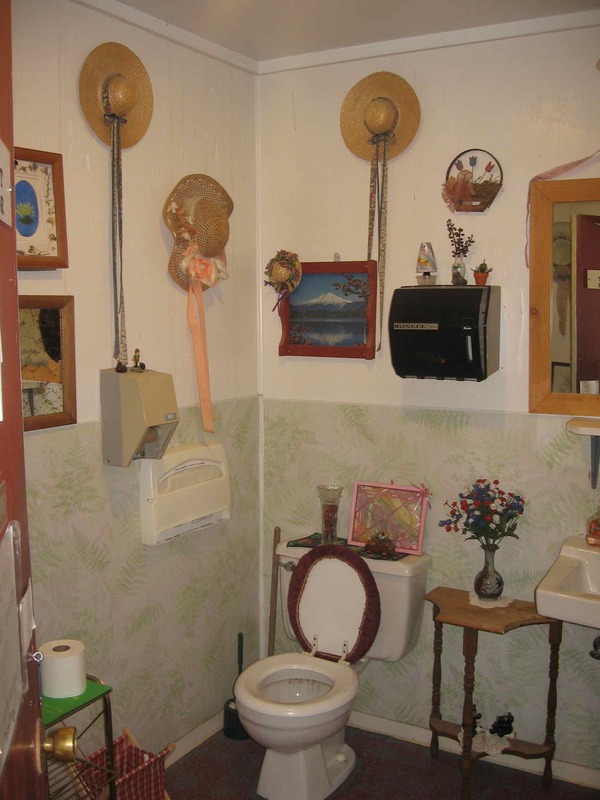 Jim and Sara complained bitterly about it and nicknamed it “rancho inferno,” but I found that the owners had put a lot of work into making the bathrooms cozy and nice. In the men’s room there was a five-stanza poem about how much the author loved using an outhouse; sadly, I was too rushed to copy it down. There was also a plaque that read, “Good luck to you, ol’ riding pard/ May your first loop always hit/ May your pony never set up hard/ And your dolly never slip.” It’s about roping, and also life I guess. The ladies’ room was decorated with hats. The falls disappeared too, but we did that ourselves. Kettle Falls was a prime salmon-fishing site on the Columbia River for at least 9,000 years, and then the Grand Coulee Dam submerged it 70 years ago. At a restaurant last night there was an old photo of the falls. It looked like a low Niagara. The volume of water going over that shelf was tremendous. Day 7 was a 66-mile ride through yet another different landscape, mainly because the mountain range we crossed was much lower. The heat eased off a bit, too. It was still real toasty, but slightly less ridiculous than in had been in the last four days. We started riding about 7:30 am. 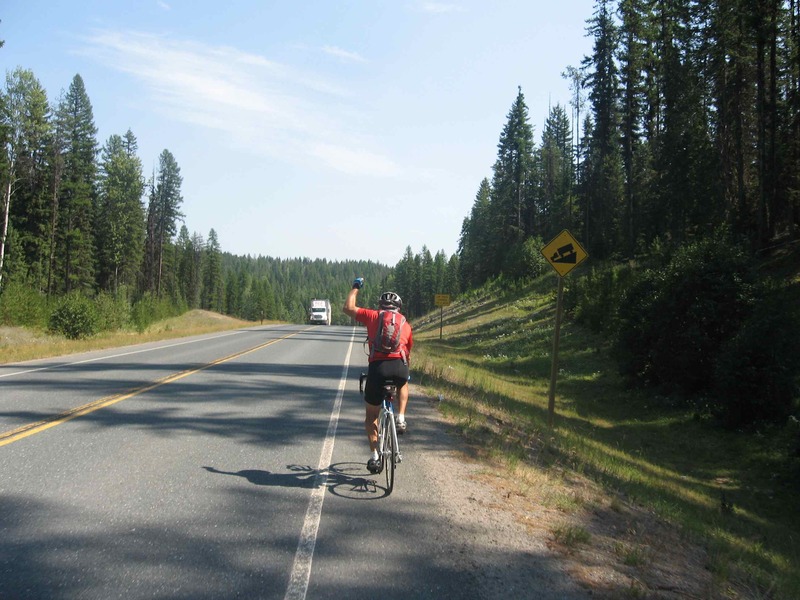 Thanks to the exquisitely well-planned routes provided to members of the Adventure Cycling Association, we were able to bypass the heavy traffic on State Route 20 between Kettle Falls and Colville. 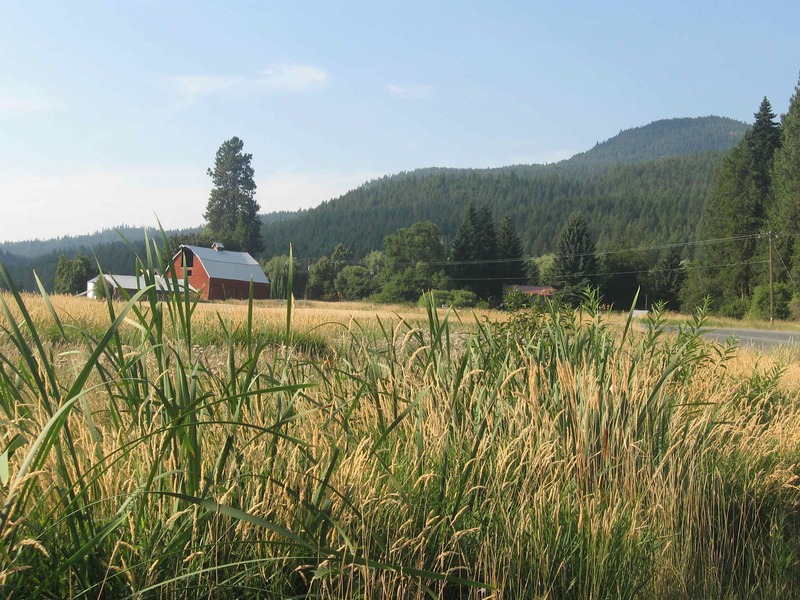 We rode on the southern side of the Colville River valley, which was strictly for working people. The valley had no tourist stuff anywhere but lots of lumber, farming, mining, and manufacturing. We rode past the Washington Headquarters of the Boise Cascade Corporation, an enormous mill with an even bigger pile of logs next to it. 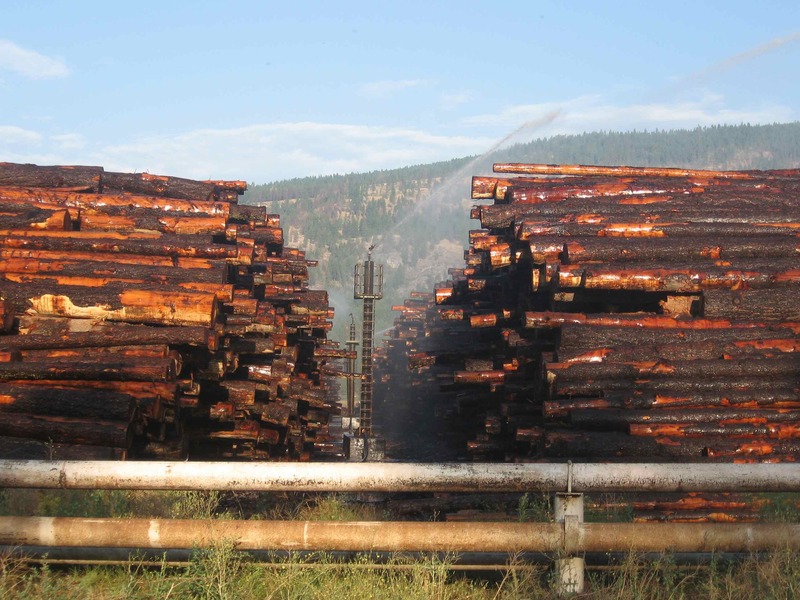 The logs were being watered with sprinklers so they wouldn’t dry out and crack before they were milled. Sprinklers are everywhere out here. We rode past farms and alfalfa fields in the exquisite pre-9am Western daylight. In one field that had recently been cut, kestrels and ospreys sat on the power poles and hay bales, intently watching the field. I saw one dive from a pole, grab a mouse without landing, pivot 180 degrees in the air, and return to its perch with its prey still wriggling. The whole manouver took less than two seconds. By 9am we were in the city of Colville, which is the county seat and seemed substantial after the miles of emptiness we had crossed. We rode down the extra-wide streets past handsome art deco buildings, looking for a mailbox and a water fountain. We found them at the city park, along with retirees out for a morning walk and day care providers sitting at picnic tables while their young wards ran in circles around them. Then we were out of there and climbing Graham Hill, the heat building now. To the north a mountain called Old Dominion rose 3,700 feet above the valley floor. This is a big mining region, and Old Dominion has major deposits of silver and lead. Ahead was a climb of about 1,300 feet through the Selkirk Mountains, with state land to the north and the Little Pend Oreille Wildlife Recreation Area to the south. We rode through 40 miles of land mostly set aside for wildlife. Although we didn’t see many animals, we saw outstanding habitat: a long creek that turned into a huge wetland and then into several pretty lakes. 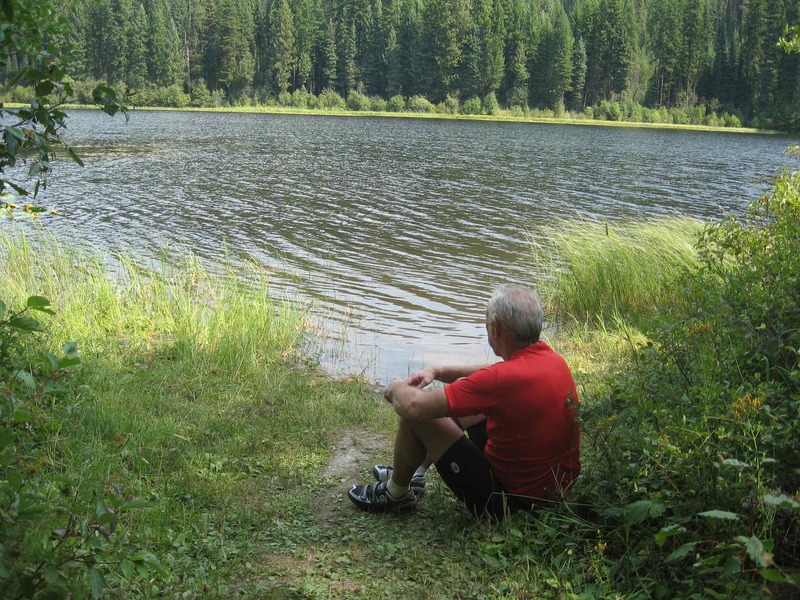 Jim’s bike thermometer was nearing 100 and we were low on water when we stopped at the first of these, Coffin Lake, for a cooling plunge. It felt better than almost anything you could imagine. The Selkirk range resembles New York’s Route 3 when it goes through the western Adirondacks. You see long flat stretches of lodgepole pines, the trail is gently rising and falling, and every so often a field or marsh or pond will reveal itself. But there were cattle resting under the pines here, and the soil was as dry as beach sand. We found a resort that had a store and water pump, filled up, and continued for a few miles. Then there was the beautiful road sign that shows a truck on a ramp, which means that you’re about to enjoy a big downhill run. We descended fast around hairpin turns and lost over 1,000 feet in a few miles, feeling like we were in the Tour De France, but really we were coming into the valley of the Pend Oreille River. 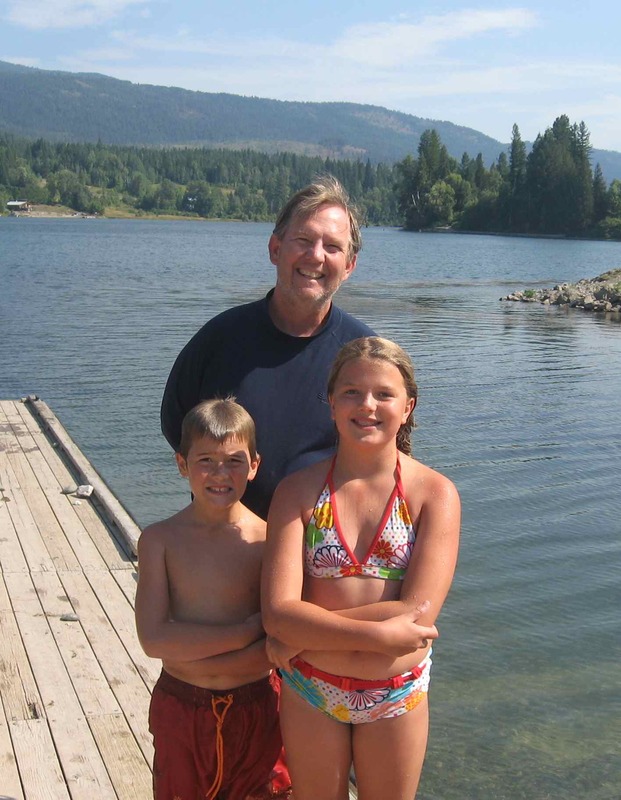 Heather said that her father used to work as a long-distance truck driver, but now he works in the lead mine north of Ione so she gets to see him more often, which is good. “He comes home and he’s really tired,” added Billy, “but he plays with me.” Then their mom showed up and said it was OK to photograph them. We said goodbye and went just up the road to Cedar Park RV Camp, a tiny, spotless field with a few semi-permanent residents who work in the mines. Next door to us was a farmette with a lot of chickens. They’ll get us up early tomorrow. The rapture and Anasazi Indians discussion must have been a treat and I would have enjoyed listening in on it, but will have to follow up on the absence of bones claim. Using Google maps I have your accumulated distance at just over three hundred miles. My own seven days of riding totals 218 miles. My left toe and right wrist are sore. However, I don’t feel any signs of chronic fatigue and yesterday’s ride around Canandaigua Lake seemed very easy and I completed it in ten minutes under three hours. I’m going to drop back now … real work, or at least volunteer work, requires my attention. Sounds wonderful in the way that getting up and going to bed outside, and putting one pedal down at a time can be! Thanks for sharing the adventure and for keepin it so real! Congrats to you all for this undertaking a great fundraiser and life-journey. I went cross country in 1982 before going to collage, and your postings are reminding me of the aspirations and accomplishments of that trip. I’ve book-marked the site, intend to keep up, and will send a donation. Twenty-six years after completing that cross-country journey, I’ll embark later this week with my wife and two sons on our first family multi-day biking trip, a mere 79 miles in three days on the Erie Canal corridor. No summits to brag about, but hopefully a good experience that will encourage them to join me for a second transcontinental ride in the next decade. Take it all in, ride safely, enjoy! Thanks for putting the kids pictures on here. They thought it was cool. But the girl’s name is Heather not Britney. The web site is cool. Looks like a great trip, I’m enjoying reading the blog. whoa dad, look at your beard!